In terms of quantity, extrusion is the most important process in the plastics industry: More than 114 million tonnes of plastics are processed with this method worldwide every year. Both flexible as well as rigid objects that can be compact or cellular can be produced with extrusion. The processing possibilities range from film, pipe, and profile extrusion to sheet, ram, and cold extrusion up to coextrusion. 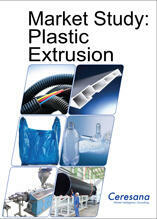 The market research company Ceresana analyzes in this present study the world market for plastics for extrusion. In 2015, about 51% of the plastics used for extrusion were used in the region Asia-Pacific; North America and Western Europe followed with market shares of 15.5% and 13.2%. The types of plastics polyvinyl chloride (PVC), polyethylene (LDPE, LLDPE, HDPE), polypropylene (PP), polystyrene (PS), polyethylene terephthalate (PET), and other plastic types are differentiated in this study. The plastic type polyvinyl chloride (PVC) is mainly used for extrusion: Over the past eight years, global demand for products made of PVC rose by an average of 2.3% per year. The second most important plastic type for extrusion is polyethylene-LLDPE with a market share of approx. 18%. The most important sales market for extrusion products is the packaging industry. The category "packaging" mainly includes plastic films, as well as bags and sacks, and shrink and stretch films. The heading packaging films includes the majority of films used for foodstuffs, but also films for non-food applications such as packaging for cosmetics, hygiene products, textiles, stationary, and similar products. The market for packaging films profits especially from a persistent trend towards flexible packaging solutions in many segments. In addition to a reduction of weight and resource consumption, flexible packaging is also expected to increase customer convenience. A trend towards smaller package sizes and a growing market for flexible packaging in the sectors hygiene and pharma will nonetheless result in growth in the upcoming years as well. The most important type of plastics in the segment packaging is LLDPE, followed by PP and LDPE. The second largest sales market are products for the construction industry. By far the most important plastic in the construction industry is PVC: In 2015, about 22.5 million tonnes of this material were used. All other types accounted for considerably lower market shares. The most important plastic products in the construction industry are pipes and windows. Besides these, many other construction components are made of plastics: floors, covers, facade elements, coatings, films, sheets, sealants, doors, small parts, and fastenings. Global increase in demand for plastic pipes is mainly generated by the growing consumption in the emerging countries. Here, new constructions play a major role. Due to the quickly progressing urbanization, densification of the residential areas and their pipeline systems are an important topic in many cities of emerging countries. In the more developed industrial states where sewage and potable water networks are already installed closely, renovation and replacement of the existing networks play a larger role than the development of new areas. The most dynamic development of demand for plastics for extrusion will however not take place in the construction sector but in the segments "transportation" and "electrical and electronics". From 2015 to 2023, Ceresana expects global demand in these application areas to increase by 3.1% and 2.9% per year. Chapter 1 provides a presentation and analysis of the market for plastics for extrusion – including forecasts up to 2023. Data on demand and revenues are given for the regions Western Europe, Eastern Europe, North America, South America, Asia-Pacific, the Middle East, and Africa. Chapter 3 thoroughly examines the application areas for plastics for extrusion: packaging, construction industry, transportation, electrical and electronics, industrial products, other applications. These sales markets are split by both the world regions and the most important countries. Furthermore, demand for the particular plastic types split by application areas is given. Chapter 4 deals with demand for the particular types of plastics: polyvinyl chloride (PVC), polyethylene (LDPE, LLDPE, HDPE), polypropylene (PP), polystyrene (PS), polyethylene terephthalate (PET), and other plastic types.